Based on home price gains, these Lower Mainland neighbourhoods have appreciated in value more than others. This presents an opportunity for locals to move to new neighbourhoods that would have previously been beyond their reach. This article will look at three areas in the Lower Mainland that have captured outsized house price gains and suggest the next areas set to leapfrog their neighbours’ house prices. In the past decade, Metro Vancouver and the Lower Mainland have seen dramatic, unprecedented, record breaking home price growth. In December 2008, a house in Metro Vancouver could be had for $710,000 and today that house would cost $1.5 million. That’s an average house price appreciation of 7.5% annually! The Toronto Stock Exchange only gained an average of 5.5% over the same timeframe. Homeowners have won big, but the winnings have not been distributed evenly. Vancouver and Toronto fared much better than Montreal and Calgary and even within Vancouver two areas stand out. Squamish and Port Moody have transformed. These neighbourhoods were once underdogs, but they’ve now graduated to the big league. The SkyTrain to Surrey was built in 1994 as part of the second extension of the Expo Line; the stations included on the extension were Gateway, Surrey Central and King George. Since opening in 1994, it has been the eastern terminus of the Expo Line however the new Mayor of Surrey is seeking funding to extend the line to Langley. It took a while for development around the Surrey stations to flourish but in recent years with Vancouver and Burnaby becoming prohibitively expensive, wealthy homebuyers have moved east in search of affordability. Ironically, that has led to outsized price gains in Surrey. That’s been a lottery jackpot for existing homeowners in Surrey but now the area isn’t nearly as good a value as it once was. Does it have more upside? Perhaps. With the proposed extension of he Skytrain line to Langley you should expect that the added infrastructure and easy access to office space and jobs will put added support on prices in Central Surrey and Langley. Keep in mind there is still risk. The money for the Skytrain is a redirection of funds approved for a Surrey Light Rail (LRT) system. Some homebuyers bought along the proposed LRT line speculating on price rises (some may have paid a significant premium) and now the LRT is cancelled. It would be controversial, but plausible, for a future Surrey Mayor to cancel the SkyTrain plans and bring back the LRT so be careful speculating on a SkyTrain. Nevertheless, in 2015 a Central Surrey home was worth $150,000 less than a Ladner home and now they are at par. Do you live in Surrey and always had dreams of living in Ladner? Now is your chance! Do you sometimes wish you could leave it all and live in a small town off the grid? Squamish isn’t off the grid but it’s pretty close with a population of 20,000 residents nestled in the Squamish Valley between Vancouver and Whistler. Do you love the outdoors? This is your dream town. Attractions include the Stawamus Chief, a huge cliff-faced granite massif favoured by rock climbers. Between Shannon Falls, Murrin Park, The Malamute, and the Little Smoke Bluffs, there are over 1,200 rock-climbing routes in the Squamish area. Kiteboarding and windsurfing are popular during the summer because the area receives predictable wind on warm sunny days. Squamish's extensive quality trail system is a key feature and tourist attractions include the Shannon Falls waterfall; river-rafting on the Elaho and Squamish rivers; snowmobiling on nearby Brohm Ridge; and bald eagle viewing in the community of Brackendale, which has one of North America's largest populations of bald eagles. If you want to ski, you’re a quick drive from Whistler and if you miss urban living you can pop into Vancouver. With the expansion and improvements to the Sea-to-Sky Highway in preparation for the 2010 Olympics the commute from Squamish to Vancouver has become more enjoyable. Although some people may complain about the cost of the highway improvements, local homeowners must be swooning. The influx of new residents is changing the community for the better, reinvigorating the downtown and attracting small businesses like craft breweries and technology start-ups. House values have risen 52% since 2015 and prices rose 13% between the Olympics and 2015. Cha-ching! The average owner of a house in Squamish has made $350,000 in three years as the benchmark price rose from $650,000 to $1 million. Yes, that’s more than $115,000 per year of tax-free capital gains. To take home the same dollar amount as after-tax income, you’d have to earn close to $200,000 in pre-tax salary. 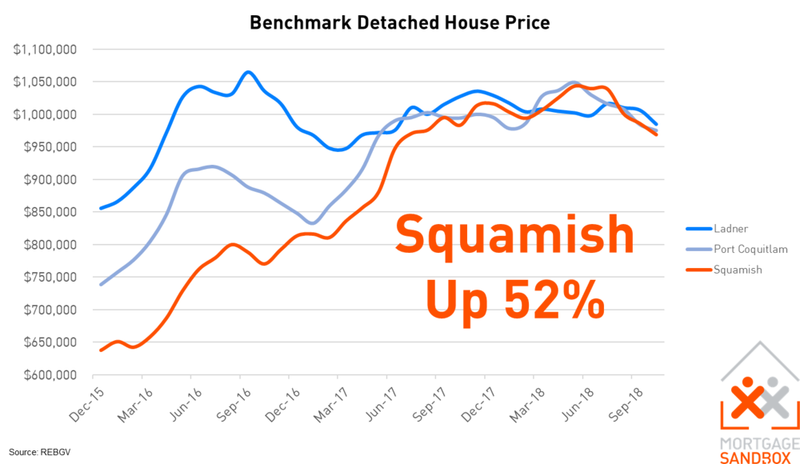 Whereas house prices in most areas have risen at the same speed, Squamish has outpaced them. As an example, in 2015 a Squamish homeowner would have had to produce another $200,000 in cash if they wanted to move to Port Moody, but today they could make the move paying a few hundred dollars in legal fees. Burnaby to Lafarge Lake–Douglas in Coquitlam. It added six new SkyTrain stations since opening in December 2016. The extension is expected to serve 70,000 passengers per day in 2021. Without the extension, Mort Moody being situated at the end of the Burrard Inlet is very geographically removed from Vancouver. 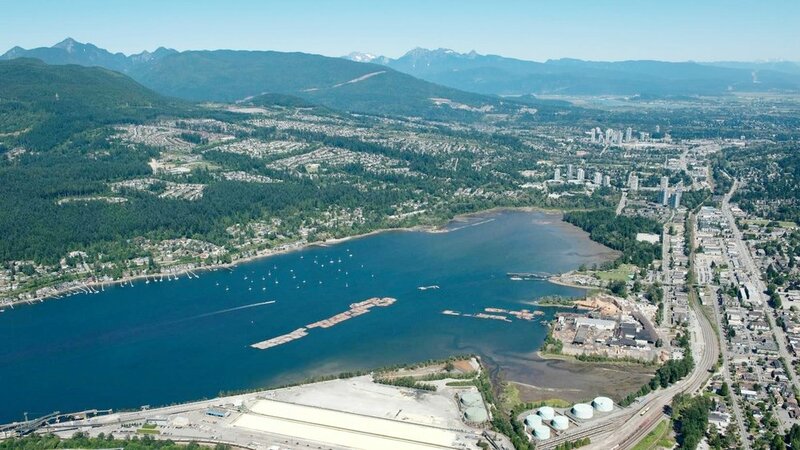 With a population of 34,000, Port Moody is one of the smallest cities in the Lower Mainland but growth is set to take off. With easy access to downtown via rapid transit, the area has been transformed with new residential towers and townhomes. The downtown has been reinvigorated with new restaurants and craft breweries. 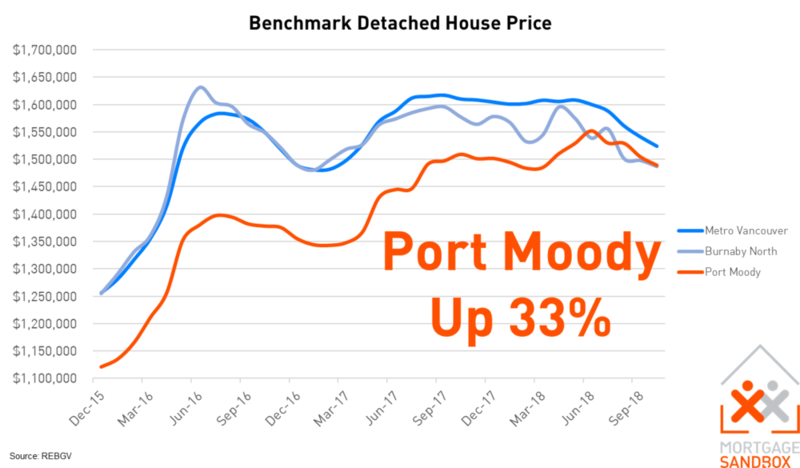 The cultural transformation and new economic vigour have changed people’s perception of the area and now Port Moody house prices are on par with North Burnaby. In other words, since 2015 Port Moody house prices gained $100,000 more than North Burnaby house prices. That’s less than a “Set for Life” scratch-and-win lottery ticket but is still a heck of a lot of money thanks to some bureaucrats deciding to spend money on a SkyTrain extension. Everyone complains about the cost of infrastructure and asks who will pay for it. Realistically, it makes sense to fund it out of property taxes since it appears that homeowners in the areas benefiting from the infrastructure earn the money back in spades. Looking forward, keep an eye on SkyTrain extensions to Langley and along Broadway to UBC. As well, keep these examples in mind for future infrastructure investments. The benefit of these investments includes revitalized retail districts, increased property values, and the ability for communities to support cultural enrichment programs. For those of you who own in Squamish, Central Surrey, and Port Moody…congratulations! You won the lottery.